The SoxProspects community has voted for its 2013 preseason All-Stars at each position. These players represent those who the community expect to have the best season in the Red Sox minor league system at their respective positions, and ideally does not take prospect status into consideration. 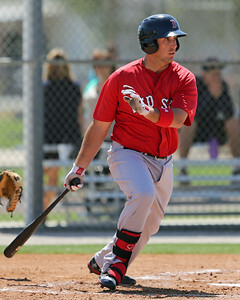 Lavarnway is coming off a 2012 season in which he struggled meeting the relatively high expectations heaped on him after he produced the best season of his professional career in 2011. 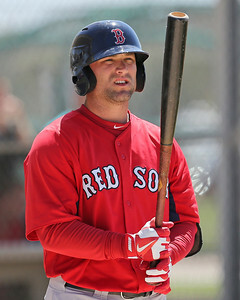 The 25-year-old started the year in Pawtucket, where he initially had trouble finding his offensive game, batting .268/.369/.376 in April and May, but finished with a respectable line of .295/.376/.439 with eight home runs in 83 games serving primarily as the catcher for the PawSox. His initial struggles in Pawtucket dawned on him again once he earned a promotion to Boston on August 1, as the Yale product endured one the roughest stretches of his five-year career – batting .157/.211/.248 in 46 games with the major league club. Lavarnway made strides in the catching department by virtue of playing roughly 80 percent of his games in 2012 at backstop, but questions arose whether his bat and improving defense can coexist. He’ll attempt to piece both his offense and his defense together in 2013, and expect him to begin that endeavor in Pawtucket while serving as insurance in case David Ross or Jarrod Saltalamacchia succumbs to injury. 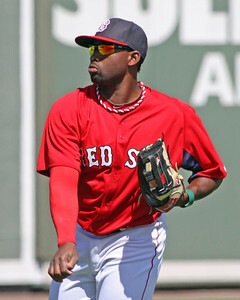 Entering his third season in the Red Sox system, Shaw is one of the few prospects Boston has to its name at first base. He's also the first player not named Lars Anderson to receive a SoxProspect pre-season All-Star award at the position since Anthony Rizzo took home the honors in 2010. The 22-year-old made the jump to Portland last season after 99 games with Salem in which he produced a line of .305/.411/.545 along with 16 home runs and 59 walks -- the latter ranked third in the Carolina League by season's end. The Kent State alumnus saw an unsurprising drop in numbers while assimilating to life in Double-A, where he posted a .227/.353/.427 line in 31 games as a Sea Dog. Shaw will return to Portland in 2013, and could supplant Mark Hamilton and Mauro Gomez on the depth chart if everything goes smoothly. Coyle, who's also entering his third season in the Red Sox system, is coming off a season which would be best described as a tale of two halves. Coyle hit just .211/.285/.343 before Salem's All-Star break, and it took a rediscovery of his simple, compact swing during the Carolina League's all-star break to yield second half success. He batted .297/.355/.451 in the three months following the adjustments to finish the year with a .249/.316/.391 line. The 21-year-old did top his 2011 average (.247 in 2011 to .249 in 2012) last season, but he experienced a drop in on-base percentage (.362 to .316) and slugging percentage (.464 to .391), struck out 116 times in 115 games and was troubled all season by breaking pitches, an issue that will continue to challenge the second baseman as he advances levels. He'll likely return to Salem for the start of the season. 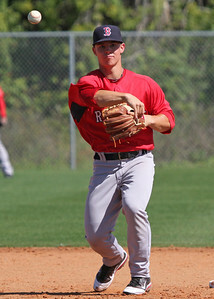 After fully recovering from a fractured wrist which limited him to 32 games in 2011, Cecchini burst onto the scene in his first full season in blazing fashion, stealing 52 bases while only getting caught six times as a member of the Greenville Drive. But the 21-year-old's 2012 campaign shouldn't be solely summed up by his steals. Cecchini hit for a .305/.394/.433 line, replete with 38 doubles and 61 walks -- which ranked third and fourth respectively in the system -- to go along with his aggressiveness on the basepaths. One aspect of his game that he will work to develop more this season is power, as he only managed to hit four out of the park last season. Expect him to be assigned to Salem to begin the season. 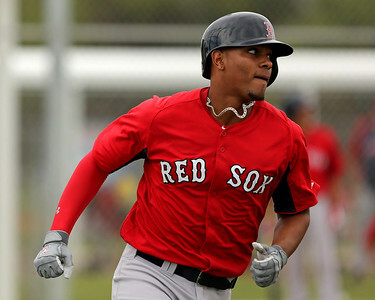 Signed as an international free agent in Aug. 2009 at the age of 17, Bogaerts made the important jump to Double-A Portland last season after he thrashed the competition in the Carolina League to the tune of .303/.378/.505 and 15 home runs in 106 games with Salem. His bat didn't skip a beat once it arrived in Portland, as he finished the year batting .326/.351/.598 with five home runs in 23 games as a Sea Dog. However, he drew 43 walks in 435 plate appearances with Salem, but the shortstop only mustered one walk in 97 plate appearances in Portland. 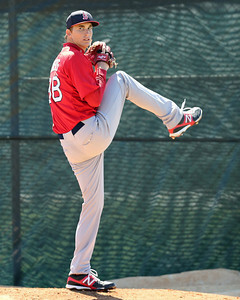 The top prospect in the SoxProspects ranking is expected to return to Double-A for the start of 2013. With all the spring training buzz surrounding Bradley, it's hard to believe the 2011 supplemental first rounder completed his first full professional season just last year. He ended the season with 61 games in Portland, where he hit .271/.373/.437 with 16 doubles, after batting .359/.480/.526 with 26 doubles and 16 steals in his first 67 games with Salem. Scouts see the 22-year-old as a potential fixture in center field in Boston for years to come, and some fans are clamoring to see the future now. If he doesn't break camp with Boston, he'll be Pawtucket bound with the strong possibility of getting more than a September call-up this season depending on how Boston's season plays out. Brentz, a 2010 first round pick, had an adventurous 2012 season, which started in Portland and ended in the Arizona Fall League after he made a pit stop in Pawtucket. In 122 games with Portland, the Tennessee-native batted .296/.355/.478 with 30 doubles and 17 home runs and struck out 130 times -- aided by his aggressiveness at the plate. When Brentz made the jump to Triple-A, he initially struggled, as he hit .118/.167/.118 in the final five games of the PawSox' regular season. But the right fielder excelled in Pawtucket's Governors' Cup championship run. In seven playoff games, the 23-year-old hit two home runs, a double, and triple, and drove in five RBI to go along with a .333 batting average (8-for-24). Brentz carried that playoff success into the Arizona Fall League, as he hit for a .297/.366/.438 line in 17 games in with the Surprise Saguaros. Brentz, who was named to the Arizona Fall League's Rising Star Game in November, will begin the year in Pawtucket to refine his plate discipline and to improve his pitch selection, but he'll likely find a spot in Boston come September. A former Auburn football recruit, Jacobs was hindered by a hand injury for the majority of his 2012 season, which caused a drop in production from his breakout season in 2011. In 114 games with Salem, the 22-year-old batted .252/.322/.410 with 13 home runs and 30 double. This season may be the most critical to Jacobs' career, as he looks to close the gap between his plus-to-better power potential and his fringe-average pitch recognition and put some of the doubts behind him. He'll most likely begin this season with Portland, which should be a strong test for him. Acquired when the Red Sox traded Adrian Gonzalez, Josh Beckett, and Carl Crawford to the Dodgers, Allen Webster is showing that the move was more than a pure salary dump. His performance for the Dodgers Double-A affiliate last season was strong, finishing his time there with a 3.55 ERA over 123 2/3 innings with 117 strikeouts and 57 walks. The 23 year-old features a fastball that sits 92-94 mph, touching as high as 97 mph this spring, with a ton of sink and thus induces a lot of ground balls. He complements that with an 83-87 mph slider and an 83-85 mph changeup, both of which have been showing plus potential. His Grapefruit league performance this spring has been one of the most noteworthy on the team, with 14 strikeouts to only one walk along with an impressive 1.64 ERA over 11 innings. Of the highly regarded Red Sox pitching prospects, he is the closest to the majors, and as you can see from last year’s numbers, the development of his command and control are what will dictate when he is ready to join the rotation. 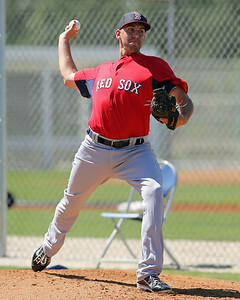 He will start the year at Triple-A Pawtucket as he works his way towards a spot in the major league rotation. 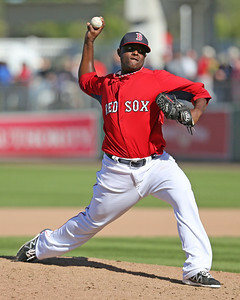 The Red Sox first pick in 2011 has shown through both his performance and scouting reports that he merited that pick. The stats back it up with a 2.86 ERA, 133 strikeouts, and 29 walks in 119 2/3 innings split between Greenville and Salem. Scouting reports show that Barnes greatest strength is his fastball, which sits 93-95 mph and touches 98 mph, but most noteworthy is that he can command it to both sides of the plate. He will continue to work on his changeup, curve, and possibly add a cutter or slider as he works his way towards the majors. The number three prospect in the SoxProspects rankings will likely begin the year at Double-A Portland, and building up his innings to around 150 will be part of the goal along the way. Taken in the same 2011 draft as fellow preseason All-Star Matt Barnes, 6-foot, 7-inch Owens was the former California high school pitcher of the year before he was drafted, and he made his professional debut at Greenville last year. The ERA did not impress at 4.87, but the 130 strikeouts in only 101 2/3 innings gave Owens the best strikeout rate in the minor leagues. He does not strike people out with radar gun breaking velocity – the lefthander’s fastball only sits at 89-93 mph – but the deception of the pitch keeps minor leaguers guessing. His curve has been a swing-and-miss pitch and has lots of potential, and while his changeup has that same potential, the consistency is not currently there. 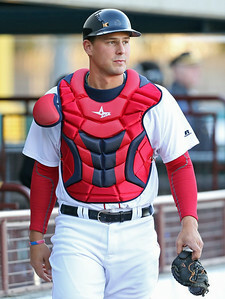 He will work on this as well as the development of his command and control as he leads the Salem Red Sox staff to begin the 2013 season. Every preseason All-Star starter joined the Red Sox in 2011 or later, and Johnson fits that theme also as he was acquired as a first round draft pick last year. Thanks in part to the earlier signing date, the lefthander was able to finish his season at the University of Florida and report to Lowell for a few innings. Unfortunately his professional season was cut short when he was hit in the face by a batted ball in one of the Futures at Fenway games. Johnson was a two-way player at Florida, and thus was a bit raw for a college pitcher. 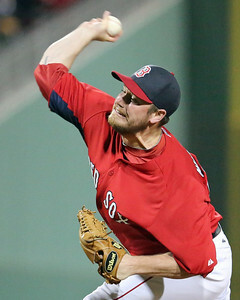 However, the Red Sox likely hope that by converting to pitching full time there will be additional potential. His current stuff does not blow you away when looking pitch by pitch: an 89-93 mph fastball with movement, an average 73-79 mph curve, an average 84-86 mph changeup. However, the whole is greater than the sum of the parts, as he commands them all well and shows good pitchability. Now fully recovered from the facial injury, he will likely start with Greenville and could move quickly up to the upper minors as he faces younger prospects. 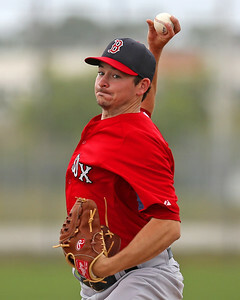 Wilson began his Red Sox career as a starting pitcher after being taken in the second round in 2009. He had success in that role 2011 with a 3.11 ERA, but the scouting reports indicated his arsenal was better suited to a relief role due to his lack of a third pitch. So in 2012 the Red Sox converted Wilson to the bullpen where he had mixed results. His stuff did begin to play up as he focused on his fastball and slider, and he had strong results in a small sample this spring by only allowing one earned run in nine Grapefruit league innings. He was optioned to Triple-A on March 16, partly due to the fact that the Red Sox have excellent bullpen depth at the major league level. Wilson will continue getting comfortable coming out of the bullpen and wait patiently for his opportunity to arrive. 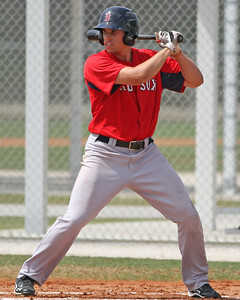 Kurcz, 22, was part of the package that the Red Sox acquired when they sent Theo Epstein to the Cubs one year ago. Listed at only six feet tall, Kurcz lacks the ideal height for a major league starter, and thus he was converted to the bullpen in 2011 and has pitched solely in that role since he was acquired. His arsenal lacks a true elite pitch, but his three pitch mix and solid mechanics have led to solid results since the conversion. 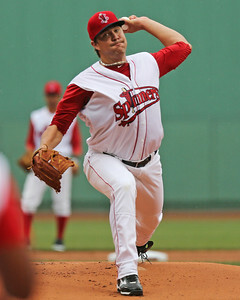 Over 50 1/3 innings in 2012 for Double-A Portland, Kurcz finished with a 3.04 ERA and 72 strikeouts with 27 walks. He will likely return to Portland in 2013 and try to build on his solid results from 2012 as part of the deep organizational bullpen depth. This spring De La Rosa raised eyebrows as the 100-mph man. After being acquired along with Allen Webster from the Dodgers, De La Rosa came over in October as a player to be named later. He will continue to be handled carefully in the short-term to protect the high-ceiling arm as he continues to increase his pitch count. This spring he was able to flash his impressive pitch mix, with a fastball that sits 94-97, a plus-to-better changeup, and a developing slider. He has the stuff right now to be a backend bullpen option, but with continued development he can wind up as a starter as long as the slider continues to progress and he is able to consistently repeat his delivery to command the ball well. He will be in a swing man role to start the year to limit his innings, and if his performance is strong he could help the big league club in a variety of ways. 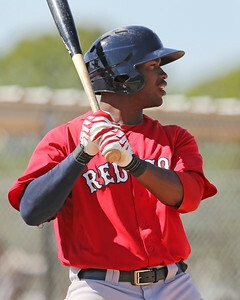 Kevin Pereira and Will Woodard are Staff Writers for SoxProspects.com. Follow Kevin on Twitter @KevinRPereira and Will @SPWill.